I just love these tags. I can wait to get my powders out and start playing. Cute tags! Love the look of the brusho! 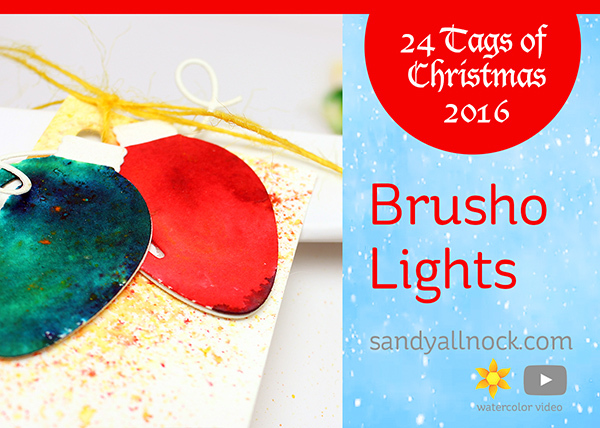 I think your Brusho tags turned out super nice…..I like the effect that each one turned out….such a creative ideas….thanks for sharing this technique…. Love these tags. I’ll have to give it a try. Love the bulbs and how you used the brusho to color them. Your lights are so cute and the wire adds so much to the tag. They are great. Fun, fun, fun. Thank you for sharing in many ways. wow love it….love your creativity and inspiration. I have never heard of brusho before. Will definitely have to check them out. Ohmy gosh I fell in love with those dies, when I saw another video with them. They are in my list to buy. Just love brushos too. I have some brusho but didn’t have a clue on how to use it until I watched your video! Love the Brusho used this way. These are just to cute! I love the vibrancy of the Brusho’s. Thanks for sharing. I love the saturated colors and what you did with them! Looks like so much fun, I must try it! Love this idea! Can’t wait to try Brushos now! These are awesome! Love how the Brusho powders look on these lights! These tags are great. I love the effect of the Brusho water colors. What a great idea – I have Color Burst colors I’ve never used but now can’t wait to try! Looks like fun I want to try this with my Color Bursts. Fabulous idea. So creative and, of course, colorful. I have the Brushos and haven’t had the guts to get “messy”. The results are so amazing and fun. I will try them and have some messy fun. Thanks so much. I have some Magenta and Brusho powders that I just enjoy using. Thank you so much for the lovely video, I am inspired and awed by your talent daily. Wow! Great use of the Brushos! Another great tag and wonderful use of the Brushos! Love these. I’ve been thinking about using my Brushos in combination with my SSS ornament dies, and your pretty lights have made me even more determined to do so. Thanks for the inspiration and incentive! I’ve never quite known what to do with Brusho, but with your great tutorial I now know. Thank you! Love the look Brusho gives the lights! Must try this! I have a big unopened container of white bags from my mini album creating days. PERFECT for using the powders as you have shown. I love to make a “gaggle of gifts” for my co-workers and decorate them in unusual ways. 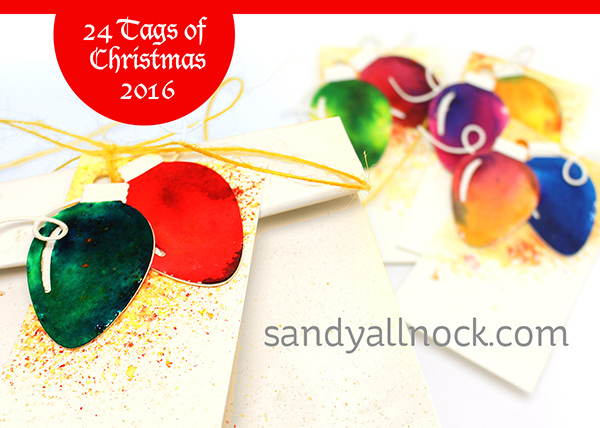 They look forward to seeing what I come up with each year and this time I can say – go to Sandy’s blog! looks like I might have to check into it now that I see the finished results. Lovely. WOW!!!! I am going to have to buy some of the Brusho’s! They look like so much fun and your tags are so beautiful!! Oh WOW!!! These are just amazing. My favorites so far. Thank you for this wonderful idea. I could not even begin to pick a favorite color. (I thought I had a favorite until you got to the end, but then they were all too cool!) Thank you SO much! The colors are really vibrant and happy. Great job on this year’s series! Brusho looks like so much fun. The light bulbs are beautiful. Love the colours, these turned out really great! I have a set of Ken Oliver’s. You’ve really inspired me to try this idea. Thank you! OMG – in the photos, these lights look just like glass – great project! I’ve had this die set sitting on my craft table for weeks, waiting for some inspiration – now I know what to do with it! Thanks & keep doing what you do!